Predicting economic recessions is a tricky business. Do you remember Dr. Ravi Batra? You probably don't. He was a Southern Methodist University economics professor and well known author. But his 1988 book The Great Depression of 1990 didn't really provide an accurate economic forecast. Now he's only known for misfiring on that prediction, though we did experience a mild recession back then. Economist Paul Samuelson wryly quipped "The stock market has predicted nine of the last five recessions" back in 1966. But maybe using the stock market as a gauge for bulls and bears is the problem. In this column, I look at economic history to provide a prediction of when the next recession will take place. Back in 2009, Harvard economist Robert Barro examined whether there is a link between stock market crashes and depressions, among wealthier and poorer countries, using historical evidence. Using data on economic recessions, I take a look at how long growth periods have been after recessions, and to see when the latest economic boom will likely come to an end. You're probably thinking "Economic boom? When did that take place?" Actually, since June of 2009, the economic has been growing, ending 18 months of decline now known as the great recession, according to the National Bureau of Economic Research (NBER). But that's nothing new. Members of the media and members of the opposition party are often reluctant to admit a recession is over until years after the growth begins. Since December of 1854, when the NBER has been tracking American growth data, the U.S. has averaged 38.42 months of growth periods following its 33 recessions. By that count, the recession should have begun just barely before the 2012 election. But that didn't happen. If anything, the American economy seems stronger today than it did three years ago. A closer analysis of American business cycle data shows that the U.S. has not always been an economic superpower, or even an engine of growth. We've had a lot of recessions earlier in our nation's history. You'd think our worst economic times were during the Great Depression (from August of 1929 to March of 1933), but from October of 1873 to March of 1879, America experienced negative economic growth. Throughout the 1800s, American growth periods averaged 27 months. From 1900 through World War II, the U.S. growth cycles were only 25.9 months, on average. But since World War II, the recessions have been shorter and the growth cycles have been longer, owing to the U.S. global economic power. 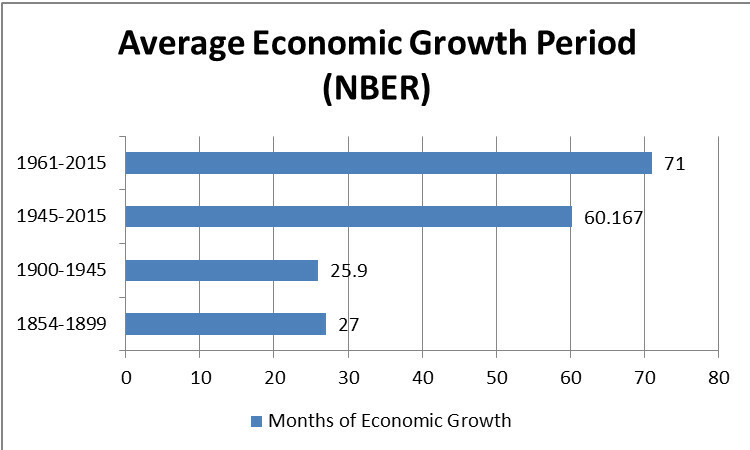 Growth periods average 60.167 months, and 71 months from March of 1961 through the present day. So when might the next recession take place? If we start with June of 2009, that would put the end of the economic boom taking place around the late Spring and early Summer of 2015. But the good news is, when the current growth period does eventually sputter out, the following economic recession may not be so long. Only three of 11 economic recessions since World War II lasted longer than a year (the Great Recession from December of 2007 to June of 2009, the November 1973 to March of 1975 recession, and the July 1981 to November 1982 recession). Before the end of World War II, 17 of 21 economic recessions lasted more than a year. However, given that members of the media and some political party candidates are still claiming the recession is still going, there's no guarantee that we won't be hearing about a recession for a lot longer than that.